Not just tech products, either. Game of Thrones is a great product, which is why I feel the need to blab on and on about it until I nauseate those who haven’t gotten hooked yet. With summer approaching, I feel the need to share with you another truly great product: the Dirty Diaper. 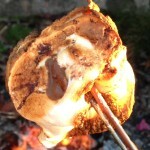 The Dirty Diaper is the result of roasting a marshmallow with chocolate shoved into it. Done correctly, you are treated to a toasted marshmallow with hot melted chocolate inside. Think new-and-improved cousin to the s’more, sans graham cracker. I can’t take credit for this revolutionary dessert.